The center section spar is pretty much a 'C' beam. For all you non-mechanical engineers, a well designed beam takes advantage of the material distribution to maximize its loading capability while minimizing the amount of material used - hence saving weight. Engineers spend a lot of time coming up with the ideal dimensions (using fancy equations) that will make this beam a perfect fit for the loading it will see - and I trust that Burt Rutan and his minions did just that. 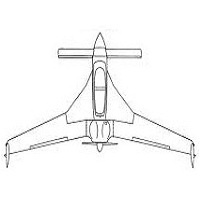 This is why it is VERY important to build the spar caps and shear web as indicated in the plans - and to exact dimensions. UNI tape is NOT the same as cutting strips of UNI cloth!!!! The plans tell us that UNI tape is 0.035" thick - so the layup schedule indicated in the plans assumes we have purchased UNI tape that is 0.035" thick. Most commercially available UNI tape these days are 0.025" thick. There is a 'hidden' CP that gives us some direction as to what to do in the event that we use this thinner UNI tape. The reason I put quotes around 'hidden' is because it's not really a CP... it's a paragraph inside CP#25 page 6 (not a Long-EZ plans change - LPC) - so unless you read through EVERY paragraph of EVERY CP newsletter - it may fall through the cracks. Although LPC #56 on CP#28 reminds us of this 'hidden' paragraph. 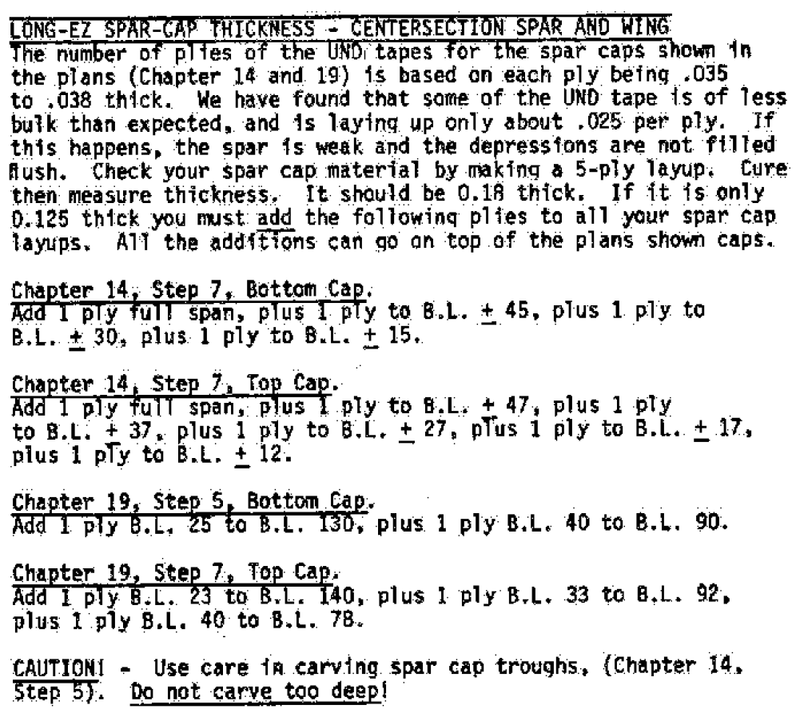 Long story short - the following paragraph gives us an updated layup schedule for the spar caps if using the 0.025" UNI tape (versus 0.035" thick UNI tape) . This is NOT a 'fix' to using uni strips cut from uni cloth! UNI cloth is 0.009" thick and completely different than UNI tape! DO NOT USE UNI CLOTH TO MAKE YOUR OWN UNI TAPE!! Purchase UNI tape from Aircraft Spruce or Wick's and you will see why UNI tape is required for the caps!! Again, it's VERY important that the spar caps are built to proper thickness so that it will be able to withstand the loads the 'C' beam was designed for. So even though the shear web was peel plied, it still required quite a bit of sanding/prep work.. It's very important to prep the surface for bonding. 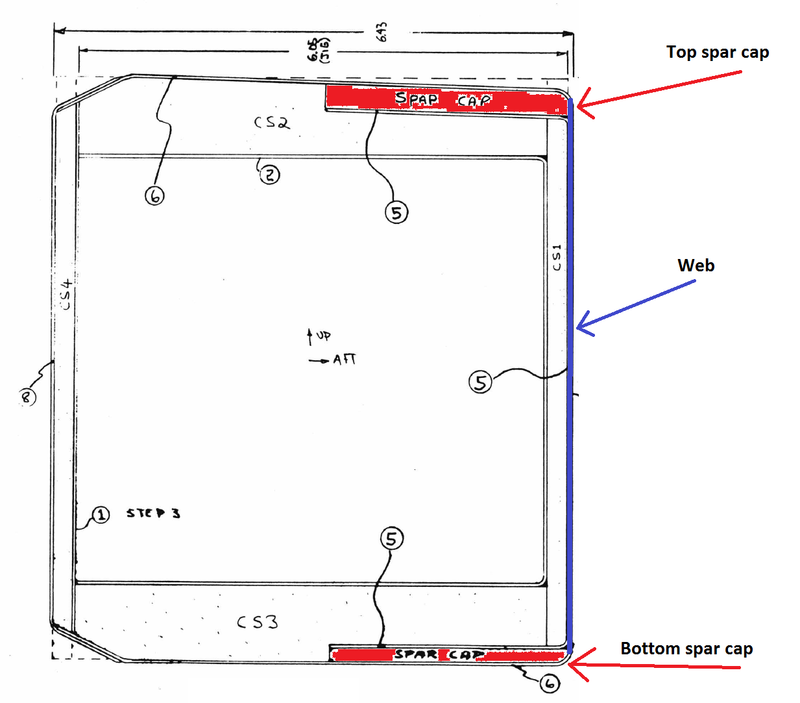 After all, a perfectly laid up spar cap would do very little if it is not properly bonded to the shear web. Here I am sanding the trough with 100 grit.. I then used hot glue to bond foam strips into place.. and added clear tape (acting like BID tape) to make sure the foam panels would not accidentally be knocked off during the layup. UNI tape comes with a red thread which runs lengthwise along one side. Its purpose is to act like a "pin" to hold the cross threads in place - notice how the red thread goes through the cross thread loops. After the UNI tape gets gently positioned into the trough onto the spar, the red thread is pulled completely out and enables us to pull the cross threads out in a single continuous motion. I had labeled all the UNI tape lengths onto the jig ahead of time - including the additional layups called out in CP 25. This layup took 9 hours! And that was WITH an assistant! I tried my best to take pictures, but again.. when the epoxy is mixed and I am in the middle of a layup - it's difficult to juggle everything while fighting the clock! I started out by adding a bead of flox along the rounded shear web corner that mates with the dam - better to fill this void with flox than to have plain epoxy fill this volume later on. I then painted a liberal amount of epoxy onto the trough surface and positioned the first ply in place... I pulled the red string from one end and gently pulled, removing it completely. Having an assistant really helps with this next step. Using a plastic card to hold the UNI threads in place, I then pulled the cross threads in a single continuous fashion... pulling slow so as not to disturb the UNI fibers. For the most part the UNI strands stayed where I wanted and behaved well; however, there were a few times where I needed help straightening them out at the ends. I cut a cheap plastic comb down to 3" and literally combed the strands straight. This worked really well! Once all the strands were perfectly straight and evenly distributed, I would mix epoxy and pour it over the strands. A really helpful trick is to first spread the epoxy very gently - with hardly any pressure. Wait a minute or two for the UNI fibers to soak up the epoxy and then begin wetting out. I noticed that if I skipped this step of letting the UNI soak up the epoxy - it would take twice as long. Another tip is to use a hair dryer as the plans state. I first try to wet everything out as much as I can - and when I see that the UNI strands give up on soaking up any more epoxy, that's when I bring in the hair dryer - just a few passes to get the epoxy warm and hence less viscous - a few more passes with the squeegee and get rid of all dry white spots. 8+ hours into the layup... it was time for the final ply!! the 24" strip.. I was about to pass out by this point! Here is a final shot at centerline just before giving it a final pass with the hair dryer! Oh, what a happy moment this was! And how about that, nearly perfectly flush with the top edge - meaning CP 25 has the perfect amount of additional layups to add if using 0.025" UNI tape! The infamous UNI tape monster!!! These were all the cross threads and red string pulled out of the UNI strips... if you are building a canard airplane - he is coming after you!!! Ok, so after a full cure... I trimmed the ends off! Notice how I had installed a foam shelf on the spar ends to hold the full-span UNI tips while they cured.. I then began to tear off the foam dam. What was left was the clear tape (did its job of protecting the shear web) and the blobs of hot glue gun.. this of course will all be scraped off and sanded/polished up! Even with the tape and blobs of hot glue gun removed, there was still a 30-50 thou step between the aft face of the shear web and the spar cap. So I decided to trim it flush with the router. Next up will be the bottom spar cap!! Stay tuned! First, beautiful work! Second, thanks for the education. Third, I hope you can explain to me why the plans say to look for waves in the top of the upper spar cap. This is in the last section of the plans, listed as "common errors" and it explains how to correct them. Mine had waves. I don't know why. Thank you, Hank for the positive comments. To answer your question about the waves – the short answer is because having waves in your spar caps drastically decreases the spar’s loading capability. The best way I can try to explain it is picture straightening out a paper clip so that it is perfectly straight (straight like a toothpick). Now try pulling on the ends – pretty darn strong! Now bend the paperclip into a ‘U’ shape. Pull on the ends. Is it strong? Nope! The ‘U’ shape will bend and deform fairly easy. Having waves on a spar cap means the UNI fibers are acting like mini ‘U’ shapes and do not have the same tensile strength that perfectly straight UNI threads have. The question now becomes how straight is considered perfectly straight. Well, they really should be straight - enough to the point where you can’t pin point a wave. I haven’t done the calculations but I would assume that having a single isolated wave (the size of a nickel or a quarter) isn’t a major issue – since the UNI threads that are straight right next to the wave will take the load. That said, if you have a very wavey spar cap – it might be cause for rejection.